What is the Context Leadership Model? The Context Leadership Model, created by Todd Little, was introduced in Stand Back and Deliver as a tool for determining the appropriate leadership style given a product’s uncertainty and complexity. The Context Leadership Model can also be used to understand the risks inherent in a product and determine how to approach analysis and documentation in a way that will address those risks. 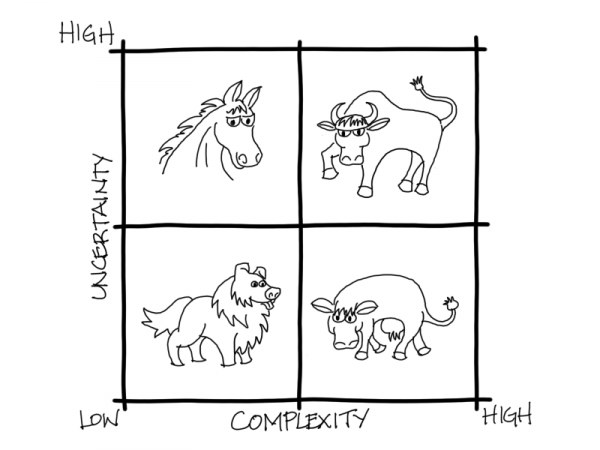 Todd chose to represent each quadrant with an animal whose characteristics mirror those of the products that fit into that quadrant. The Complexity Attributes table shows a sample set of attributes and scoring model described in Stand Back and Deliver that you can use to determine where your project fits on the complexity scale. The Uncertainty Attributes table presents a sample set of attributes and scoring model described in Stand Back and Deliver that you can use to determine where your project fits on the uncertainty scale. The Quadrants Explained section provides additional explanations of each quadrant. Medium Uncertainty (3): Initial market target is likely to require steering. Medium Uncertainty (3): We’re not quite sure if we know how to build it. Useful approaches: Build a shared understanding on the team, then stand back and let the team deliver. Kanban can be useful in this setting. Nature of analysis: Resolve known unknowns; Build shared understanding with team and stakeholders. Description: Solutions that introduce new products or services or support new business processes. Little to no impact on existing systems or teams. Nature of analysis: Iteratively discover unknown unknowns; Resolve known unknowns; Build shared understanding with team and stakeholders. Useful approaches: Approaches that allow for iterative techniques at the team level and coordination among multiple teams. Customer development techniques may be helpful in these situations but you may need longer learning cycles. The following figure shows the Context Leadership Model reflecting where the four case studies from Beyond Requirements fit. When starting a project, complexity and uncertainty analysis can help the team determine its initial risk profile. Subsequent reevaluations of the risk profile can be helpful for deciding whether existing risks have been addressed and new ones have arisen. The Context Leadership Model is a quick way to assess a project in relation to common risks that all projects face and determine appropriate process and analysis approaches to address those risks. 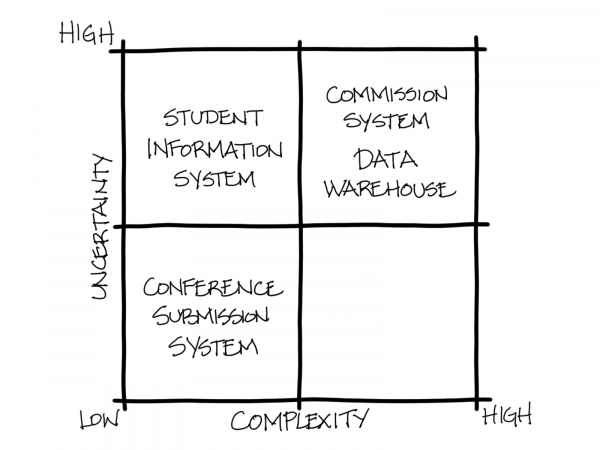 Identify the attributes and the scoring that you will use for complexity and for uncertainty. A sample set of attributes and scoring model are summarized in the Complexity Attributes and Uncertainty Attributes tables. Score the project and compute the average scores for complexity and uncertainty. Identify the quadrant in which the project falls. Is it a sheepdog, colt, cow, or bull? Determine appropriate analysis approaches based on the suggestions in The Quadrants Explained section. Look at the individual attributes to determine if any represent a significant risk that you need to address in your project. Look for some suggestions for how to address those risks in the Addressing Risks section below. Reduce Risk: Split teams into smaller cohesive groups. Mitigate Risk: Make sure teams have a shared understanding of their purpose and the overall project success criteria. Bring teams together at regular intervals. Define, communicate, test, and manage project interfaces. Mitigate Risk: Make critical decisions and overall project status visible to all stakeholders. Ensure that stakeholders understand the consequences of key decisions. Reduce Risk: Colocate the team if possible. Mitigate Risk: Bring team members into face-to-face contact often. Invest in high- bandwidth communication and collaboration tools. Mitigate Risk: Make sure that time is allocated for mentoring of new team members, and invest in training and improvement for the entire team. Reduce Risk: Staff the team with members who have strong domain knowledge and use them to mentor other team members. Ensure that customer needs are constantly represented. Mitigate Risk: Educate and expose team members to the domain. Have team members sit with users and experience how they use the product. Reduce Risk: Eliminate dependencies of work with static versions of dependencies. Build automated tests to check dependencies. Mitigate Risk: Invest in communication with teams that depend on you. Understand their needs and be clear about your progress. Reduce Risk: Target a specific market segment that is better understood. Mitigate Risk: Deliver iteratively, use prototypes, and elicit customer feedback on a regular basis. Reduce Risk: Accept proven technologies. Mitigate Risk: Design flexibility into situations to enable decisions to be made in the future. Delay decisions where the uncertainty will resolve itself. Conduct experiments that will provide information to help resolve the uncertainty. Reduce Risk: Target a specific customer segment or group of customers. Mitigate Risk: Use a product champion to solicit multiple customer voices and move them in a unified direction. Use the Purpose-Based Alignment Model and decision filters to help you determine which customers to focus on. Reduce Risk: Shorten the duration or deliver functionality in incremental releases. Mitigate Risk: Deliver incrementally and maintain high quality throughout the project. Reduce Risk: Exert control over change where it has the biggest impact. Delay decisions so changes can be made without major impact. Mitigate Risk: Use incremental delivery and feedback to enable change to be absorbed into the project. Avoid committing to too much detail early. While colt projects are ideally suited for agile approaches, that should not be taken to mean that agile approaches do not apply elsewhere. Even the lightly prescriptive agile approaches would most often be overkill for sheepdog projects; as long as the team has a clear picture of what they are trying to accomplish and a simple way to stay coordinated, that is probably all the process ceremony needed. Cow projects can use agile approaches, but those approaches need to be supplemented by additional coordination activities between impacted teams and stakeholders. Agile can also be used for bull projects, but since the best way to address those projects is to split them into colts and cows, the thoughts for each of those projects apply. It is possible for projects to move from one quadrant to another based on changes in their risk profile. Colts become bulls when the organization cannot properly control scope and ends up involving other projects and systems in what should have been a fairly isolated effort. Cows become bulls when the product owner cannot make decisions at the appropriate time, thereby adding excessive uncertainty. If you learn better with video rather than reading, you may want to check out Analysis Techniques for Product Owners Live Lessons, a set of video training sessions that show you how to apply analysis techniques to product ownership. Lesson 3.3 focuses on the context leadership model.